Underscoring the aesthetical dimension of the Ving Tsun Kuen Kuit Suen Hak [Seal Engravings of Ving Tsun Kuen Verses], this project comprises the presentation of the 51 chops in a large-scale paper format (22" × 30"). The images were selected from stamps obtained from two sources: direct rendering from the seals, obtained in May 2014; and reproductions from stamps printed at the Ngau Gu Jaai Yan Po [Catalog of Seals of the Palaeophiles’ Studio], in February 1976. 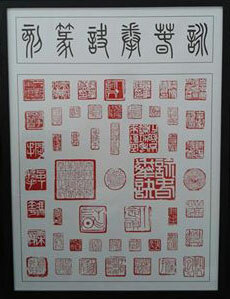 They were then proportionally enlarged and carefully displayed over the same surface, with the intended result of promoting the appraisal of formal contrasts and correlations between them, as well as simply pleasing one’s eyes and, of course, informing those who can read Chinese (specially its ancient forms of writing).